DALLAS - The two-building Mockingbird Towers development between Stemmons Freeway and Love Field is getting $7 million in upgrades. Investor Caddo Holdings bought the two-tower, 450,000-sf office project east of Stemmons Freeway. Caddo Holdings began renovations last year to bring new businesses back to the area near Dallas' Medical District and the busy airport. Built in 1970, the high-rise development is less than 50 percent leased. The biggest change has been tearing out a central atrium area between the towers. The public space is being redone with wooden decking and seating areas. 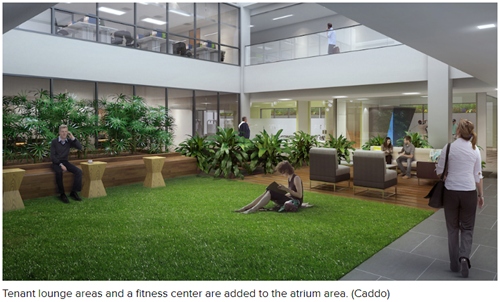 "We are trying to incorporate tenant lounge areas," Caddo's Dustin Schilling said. "It gives people a place to get out of the office and have lunch. "We are doing a golf simulator and a fitness center," he said. "And there's a new conference center."